Round Line: The original round body cylinder that can be used in a wide variety of industries and applications. Compact: Space saving cylinders for use in applications with limited area. NFPA: Heavy duty, repairable cylinders that meet NFPA standards. Guided Thrusters: For use in non-rotating applications where side or moment loading may be present. Rodless: Linear motion within half the length of rod style actuators. Rotary: Rotational motion solutions for commercial or industrial applications. Position Control: Continuous position sensing and control for measurement and positions applications. Round Line ISO: Bimba's ISO Cylinders are designed to be easily interchangeable throughout the world. Click to learn more about Bimba's new technology platform enabling users to be proactive about maintenance and system optimization. A one-of-a-kind breakthrough in pneumatics, IntelliSense® combines sensors, cylinders, and software to deliver real-time performance data. Delivering cutting-edge solutions to engineering challenges is Bimba’s top priority. Bimba's innovative designs have helped countless OEMs and MROs meet the demands of changing markets and new needs. In fact, Bimba created their Original Line of non-repairable, stainless steel body air cylinders for a customer who couldn’t afford the amount of down-time necessary to repair tie-rod cylinders. Since then, the breadth of Bimba’s custom and semi-custom solutions has grown to nearly half of their business. While other companies walk away when off-the-shelf products don’t measure up, Bimba will do whatever it takes to develop a solution for your unique application. Bimba has the knowledge, experience and drive to tackle the toughest challenge. Acro: Designs and manufactures innovative pinch valves and fluid control components for the medical, bioprocessing and industrial markets. MEAD: Design and manufacturing of pneumatic components for the industrial automation market, including pneumatic valves. 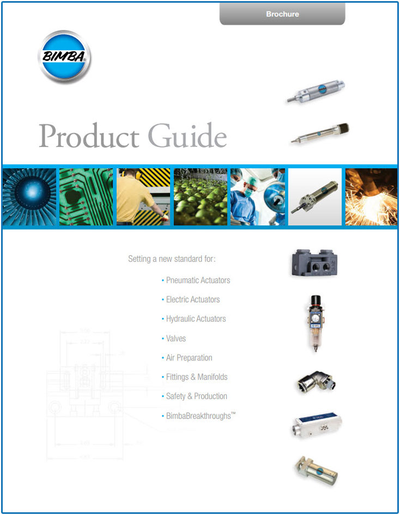 Pneumadyne: Manufacturer of pneumatic components and pneumatic control systems. TRD: Bimba's TRD Division manufactures cylinders that are renowned for their durability, high-quality construction and long-lasting performance. Find all of Bimba's videos on their YouTube Channel.